A lot of people are interested in working in a pharmacy, but really have no clue what a pharmacy technician actually does each day behind the counter at a hospital or drug store. Not to mention how much more convenient it is to become a certified pharmacist, thanks in part to online pharmacy tech schools. It’s no wonder the interests of more folks have been peaked. Well, a pharmacist technician’s main job is to assist pharmacists with a variety of things including labeling, dosages, medication dispensing, and even formulating medication. 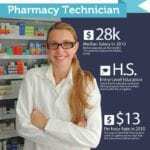 There is always a need for trained pharmacy technicians and those with formal education will most likely be selected, although no education beyond a high school diploma is usually the minimum from state to state – check state by state pharmacy technician requirements here. 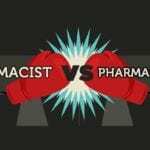 In some pharmacies, the clerks and the pharmacy technicians are the same job. They will have the pharmacy technicians act as register clerks as well as perform their normal job duties. A lot of people learn on the job when it comes to becoming a pharmacy technician, or they start out as clerks and work their way up to a pharmacy technician. Then there are those that get formal education and training. These folks are always going to look better on paper as far as a resume. You can often find a pharmacy technician doing a lot of clerk duties around the pharmacy, which could mean filling prescriptions, assisting the pharmacist, or even working on patient records in the computer database. They can also be charged with the task of filling a bottle with the right number of pills and putting the correct label on the medication as well. You will of course have a licensed pharmacist checking the work that you do, simply because it is required by law. Plus it is a great way to have two sets of eyes and be even more sure that a mistake is not made. Those that work in a hospital are often going to be putting together packets of medication and labels that are meant to help nurses hand out the medication that they need to when helping their patients. A licensed pharmacist will need to supervise in the hospital as well, as one wrong mistake with a drug or the amount of a drug could be fatal. The salary is usually going to be higher and the demand for perfection is usually going to be higher when it comes to hospitals as well.